Discover Toronto's roots on this two-hour walking tour that traces the city's beginnings as York, the second capital of Upper Canada, and charts its journey into the multicultural metropolis it is today. Depart at the bustling Union Station and financial district, the tour introduces travellers to the iconic landmarks of Old Toronto, from St. Lawrence Markets to City Hall. The perfect introduction to modern life in the big city. 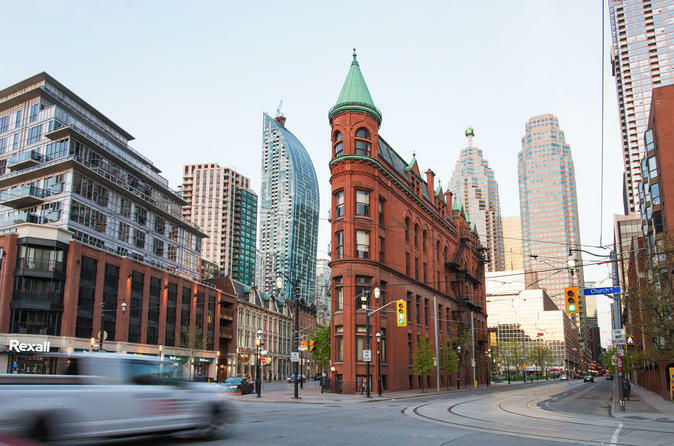 Tour tour begins at Union Station's Great Hall were your will retrace the steps of how Toronto became the metropolis it is today, learning about the first nations that lived here to the moments what made Union and Royal York hotel an integral part of the city's history. Then learn about the city's architectural stand out from the some of the city's controversial skyscrapers to the iconic CN Tower. We will journey through the underground and explore's Toronto's PATH as you try to orient yourself in this modern maze. We will talk about Canadian most beloved pass time and how our strong financial institutions have carved out an influential place in the development of the city. Then we step back into the 1850's and early 1900's in Toronto's old town by our iconic Flat Iron Building and Berzy park as we retell some stories of charming characters who molded the city. Then we will stroll thought St. Lawrence Market and learn why it was voted as the worlds best market by National Geographic. Finally, as we make our way towards Old City Hall, we will learn about the must-see neighbourhoods, local highlights that will help you enjoy the rest of your stay here in the city. Walking distance is 2.5 km and approximately 2 hours.